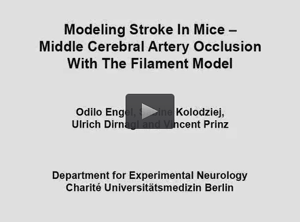 We would recommend you to watch the movie of "MCAO model in the Rat" published on Journal of Visualized Experiments by Uluç et al, and the movie of MCAO in miceby Engel et al. The article provides great details on MCAO surgical procedures. There are two vascular approaches for intraluminal access of MCA, the ECA approach and the CCA approach, which has to be determined before your formal experiments start. The ECA approach provides better reperfusion through CCA whilst the CCA approach can only provide reperfusion through Willis Circle. A recent study by Morris, et al systematically compared the Variables influencing ischemic injury in these approaches, providing useful information for selecting the optimal vascular approach. 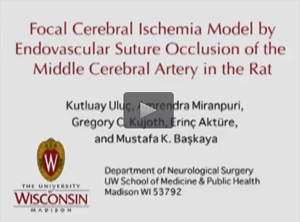 Learning intraluminal MCAO Models from the following selected video articles. Define the animal size for your study. Do a pilot study to determine the optimal tip diameter, coating length, and optimal inserted length of the MCAO suture for your animals. This step is critical for the success of your stroke modeling. Before your MCAO procedures, weigh your animals, and match monofilament diameters in proprotion to animal body weights. Mark the predetermined optimal inserted length on the bare surface of monofilaments using the Sharpie Metallic Silver marker pen, which we provide for your convenience. Disinfect monofilaments (MCAO sutures) with 70% ethanol or sterilize with ethylene oxide. Tie a knot around the external carotid artery at a position 1-2 mm upbloodstream to the point where the monofilament is to be inserted. This knot should be easy to loosen, or be reopened, and also tight enough to stop bleeding. Once the monofilament has been advanced to the pre-marked desired length, it will be necessary to apply a micro vasselclip on the internal carotid artery so to immobilize the inserted monofilament. Dislodging of monofilaments occurs frequently after animals wake up and move around. For reperfusion, we suggest you do the following actions in sequence: loosen the knot that you tied in step 5, temporarily open the micro vessel clip, withdraw the monofilament, re-apply micro clip after the monofilament has passed over the position where the micro vessel clip applied, continue withdraw the monofilament until it has passed the opened knot, then re-tie the knot to stop bleeding. When these procedures have been finished, reperfusion will occur when you remove the micro vesselclip. Carefully clean the recovered monofilament if you intend to reuse it. The recovered monofilament may be reused if its coated surface is intact. The tip diameter and surface smoothness may have been altered during the process of inducing an MCAO model and reperfusion. Applying a little silicone oil (Sigma, choose the ones with the lowest viscosity) to the coated surface may increase smoothness.